Don’t forget that there are millions of reputable businesses and organizations that follow best practices and depend on email to build relationships. Here at Constant Contact, we have more than 600,000 small businesses, nonprofits, and association customers that use our tools to stay connected with their audience. Constant Contact has a no tolerance spam policy. We have teams that monitor large import lists and emails going to a large number of subscribers. Any customer found to be using Constant Contact for spam will be cut-off from use of the product immediately. Learn more about Constant Contact’s Anti-Spam Policy. It’s our policy at Constant Contact that every email contains a mandatory unsubscribe link. This link makes it super simple for contacts to opt-out if they choose to do so. To provide further protection, it’s our policy that those individuals who try to remove this link will be warned that they are doing so. If the link is removed or de-activated in any way, Constant Contact will terminate the customer’s account. But one of the benefits of using an email marketing provider is that you have access to professionally-designed email templates that you can use to send your message. These templates are designed to make it quick and easy to get your message out to your audience, and ensure you look professional when it lands in the inbox. We take care of the design work for you, so that all you need to do is add your content and customize your message to fit your brand. And when you do get stuck, we have a team of people who are dedicated to your success. Just pick up the phone and give us a call. We also partner with marketing experts throughout the country, so if you don’t have time to get your email marketing done on your own, we can connect you with someone to help. In fact, email is almost 40 times more effective than Facebook and Twitter combined in helping your business acquire new customers (McKinsey, 2014). It’s not that you should dismiss advertising and social networks altogether. According to a 2014 Constant Contact survey, small businesses that use multiple methods and channels in conjunction with email reported more customer engagement (73 percent), more new customers (57 percent), more website traffic (54 percent), more revenue (40 percent), and more referrals (39 percent). You’ll get the best results from both of these channels when you use them together. Still have questions about email marketing? We’d love to hear your questions in the comments below. 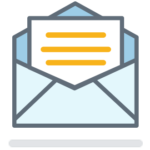 If you’re interested in giving email marketing a try, our Get Started with Email Marketing guide can help.